In his previous volume, Robert Michulec examined the role of "Das Reich” in the invasion of France. This latest work provides an invaluable partner as it looks at the participation of "Das Reich”, now established fully as a Waffen SS division, on the Eastern Front. Unfortunately, due to sales rights restrictions, we cannot offer 6534: Into The Cauldron: Das Reich On The Eastern Front for sale in your country. In his previous volume, Robert Michulec examined the role of “Das Reich” in the invasion of France. This latest work provides an invaluable partner as it looks at the participation of “Das Reich”, now established fully as a Waffen SS division, on the Eastern Front. The volume commences with a description of the “Das Reich” Division as it took part in Operation Barbarossa, the invasion of the Soviet Union from 22 June 1941 onwards. What followed was a stunning series of victories that swept “Das Reich” and other German units to the very gates of Moscow. However, stiffening Soviet resistance and frigid winter conditions brought the momentum of the assault to a grinding halt. After refitting in France, the division returned to the Eastern Front and participated in combat in places like Kharkov and in the momentous Battle of Kursk in July 1943. After this, “Das Reich” was involved in the bitter retreat back to the borders of the Fatherland, including episodes such as the effort to relieve the Korsun Pocket, as well as combat in Hungary. The book documents the waxing and waning fortunes of “Das Reich” in a rich collection of black and white photographs. Pictures show troops in the lead-up to the invasion of Russia, as well as in combat in the vast Soviet interior. These photos show troops, equipment and vehicles in all sorts of conditions from the summer dust to autumn mud and winter snow. In this book from Concord Publications’ Warrior series, the fighting man of “Das Reich” naturally remains the focus, and it gives some indication of the kind of hardships he endured on the Eastern Front. In the center of the book, the artist Dmitriy Zgonnik displays four colour plates showing typical soldiers resplendent in their combat equipment. Throughout the book, the author has included detailed captions about specific characteristics of “Das Reich,” its equipment and organization. 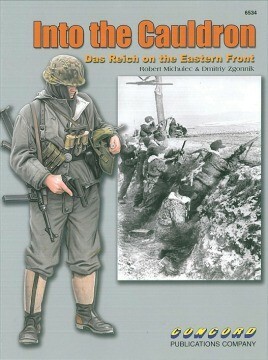 This is a fitting second volume about this famous German division, and it traces in some illustrated detail its exploits on the Eastern Front. ... a very interesting title with some superb photos that I found most interesting. This is an excellent collection of photographs of the Das Reich soldier on the Eastern front ...giving the modeller or enthusiast a broad range of subjects to study or emulate. Highly recommended. Some very accomplished colour plates of uniform adds a pleasant splash of colour, making this a very attractive production.